How many times have you been at the range and thought “What do we do if someone gets shot or injured during training?” You’d be surprised to learn that there are a lot of range facilities that do not have a posted Emergency Medical Action Plan (EMAP) in place to deal with serious on-site injuries! Sure, they may have a policy protocol established in their range operations manual, but who is responsible for executing it? Have they been trained appropriately on how to respond to medical emergencies and what resources are available on site to actually deal with serious injuries? If you do ask that question at the range, most of the time the response will be to use the first-aid kit that is available on site and to call 911 for serious injuries. It’s obvious that there needs to be a much more detailed plan other than just slapping a band-aid on a wound and waiting for EMS to arrive. It has been my experience when inquiring about EMAPs at range facilities that they are not all prepared to deal with serious medical emergencies and lack proper equipment and training to deal with trauma injuries. So let’s explore some steps on how to establish a reliable EMAP and how it can be implemented so students, instructors and range staff alike will know these procedures and what actions to take at the onset of each training evolution. 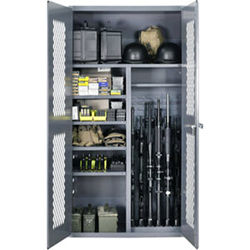 Start out by acquiring medical supplies and build medical kits that can be easily identified and accessible on the range. I recommend building a First-Aid Kit, a Trauma Injury Kit and AED Kit. The First-Aid Kit is typically built using a heavy duty plastic tool box or tackle box that is orange or yellow in color. Use an indelible black marker to write FIRST AID KIT on the front, back and sides of the box in large letters so it can be easily identified. The First-Aid Kit will include all of the essential medical supplies that will be used for non-serious injuries and will be accessed regularly to treat small scrapes, cuts and other minor injuries. 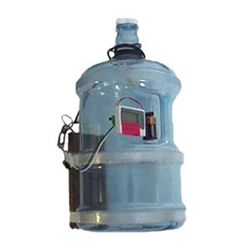 This kit should be monitored on a regular basis to ensure that used items are replenished. The Trauma Injury Kit is typically built using a heavy duty plastic tool box, tackle box or soft canvas bag that is RED in color. Use an indelible black marker to write TRAUMA KIT on the front, back and sides of the box or bag so it can be easily identified. 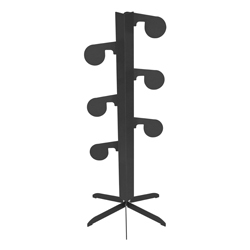 While this kit will rarely, if ever, be accessed (hopefully you won’t need to use this kit!) it should also be monitored regularly so items with expiration dates can be rotated out and replaced with fresh supplies.The Trauma Injury Kit will include all of the essential medical supplies that are needed to treat serious trauma injuries such as; hemorrhage control, deep lacerations, penetrating puncture wounds, gunshot wounds, sucking chest wounds and tension pneumothorax. 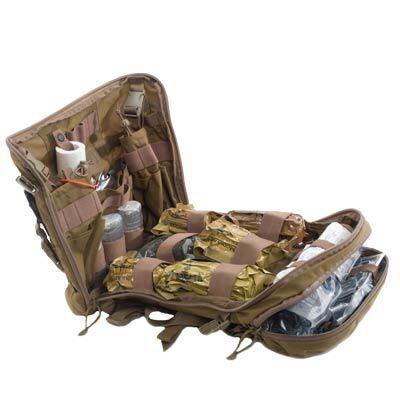 The Trauma Injury Kit should ONLY be accessed for serious injuries and by personnel that have been properly trained in TCCC (Tactical Combat Casualty Care) or training of equivalent level. The AED Kit (Automated External Defibrillator) is something that every range facility needs to acquire and have available at all times. While AED units can be purchased new, with a little work searching on the Internet, you should be able to find a source that will donate a decommissioned unit for your facility. The First-Aid Kit, Trauma Injury Kit and AED Kit should be kept on-site where the training is actually taking place and immediately accessible. These kits will be useless if they are kept in a range building down the road or in a vehicle parked 100 yards away! The next step is to establish a communication protocol to contact 911 for EMS response. While hard line phones may be on-site, they might not be immediately accessible on the range. I recommend assigning at least (2) range staff members or students with reliable cell phone service to keep their phones with them on the range in the event a 911 call needs to be made. Another option is to have a police radio on the range for direct contact with dispatch. Assign (2) people to emergency call duties in case one of them is the person that is injured. Create a laminated handout, outlining the EMAP, that can be kept on the range and accessible with the medical kits. The handout should contain the physical address of the range facility, GPS coordinates (for Life Flight dispatch) and the direct phone number to EMS dispatch. The direct number is important, as a 911 call on most cell phones may not always reach the dispatch center for the area you are training at. Having the direct number to dispatch available, the people assigned to emergency call duty can preprogram that number into their cell phones. Include the name, address and phone number to ER of the closest Level 1 Trauma Center in the laminated handout in the event the decision is made to use one of the vehicles on site to grab and go vs. waiting for an ambulance. Sometimes it may be quicker to drive someone to the local hospital vs. waiting for EMS to respond. If you do decide to grab and go, make sure a phone call is made to the hospitals ER in transition from the range to the hospital to notify them of what you have and ETA to ER. In summary, review the EMAP with everyone at the beginning of each training evolution during the range safety briefing. Show everyone in the class where the medical kits will be located on the range. Identify range staff that are TCCC qualified. Identify any students in the class that might have a medical skills background and recruit them to assist the range staff, should a medical emergency occur. Assign at least (2) reliable people on the range to emergency phone call duties and verify the direct dispatch number, GPS coordinates and range address with them. Make sure they know where the laminated EMAP handout is located with this information. Lastly, if a serious injury incident does occur, whether you decide to wait for EMS or grab and go to the hospital, be sure to secure the area where the incident occurred as responding LEO’s will be required to process that area as part of their investigation. 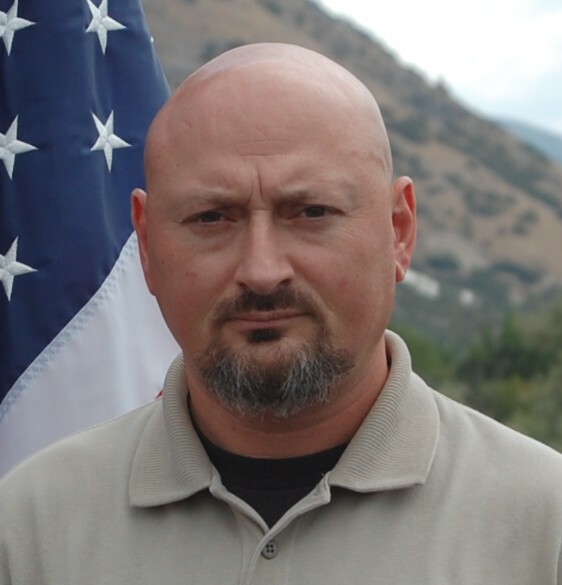 It is also recommended that anyone that witnessed the incident remain on scene for LEO debrief. If you follow these procedures and develop a sound EMAP, you’ll be ready to handle any emergency medical situation that occurs on your range. Another successful SHOT Show is in the books, and this year was just as busy as any with nearly 64,000 industry professionals attending and more than 1,600 exhibiting companies. The show, which takes place at the Sands Expo Center in Las Vegas every January is the largest firearms tradeshow in the world and is a great place to show off new products and make connections in the shooting and hunting industry. 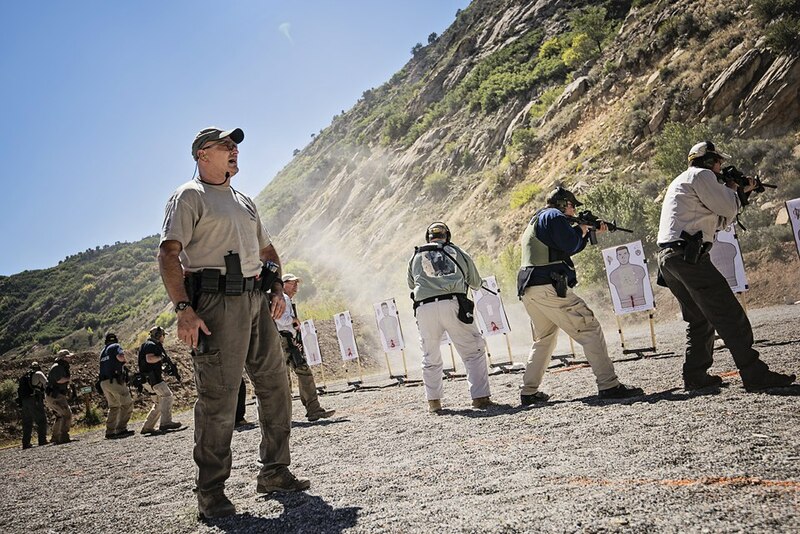 Action Target and its subsidiary Law Enforcement Targets once again sponsored SHOT Show Industry Day at the Range which is held every year at the Boulder Rifle and Pistol Range in Boulder City, Nevada, the day before the show starts. Industry Day at the Range is an integral part of the show and allows both media and buyers the opportunity to try out new guns and shooting accessories. 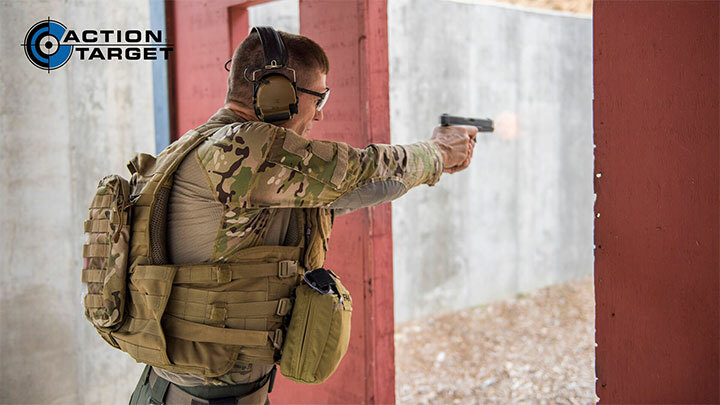 This year, more than 1,100 media members and 500 buyers converged on the outdoor range complex where everyone got the chance to shoot a few rounds and try out this year’s new gear. All of the targets used at the range were provided by Action Target and Law Enforcement Targets and included an array of steel and plastic targets. More than 160 Industry Day exhibitors were judged on their firearms safety practices by a panel of safety auditors from DOA Tactical. The scores for each exhibitor were determined based on specific safety criteria such as the handling of firearms, ammunition placement, and maintaining a safe environment at their shooting stations. Smith & Wesson was the winner of this year’s award for holding the highest standard of safety during the event. 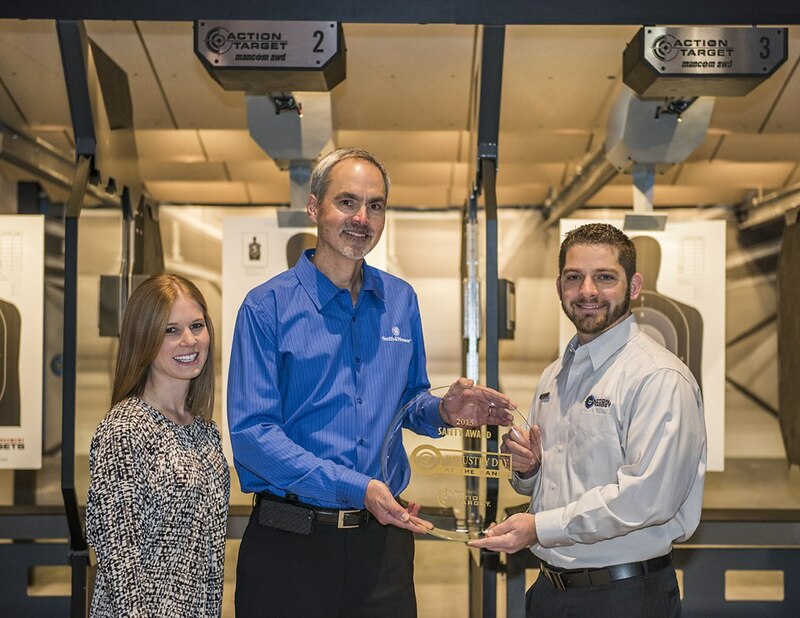 The award was presented in Action Target’s booth to Smith & Wesson’s Director of Marketing Jan Mladek. 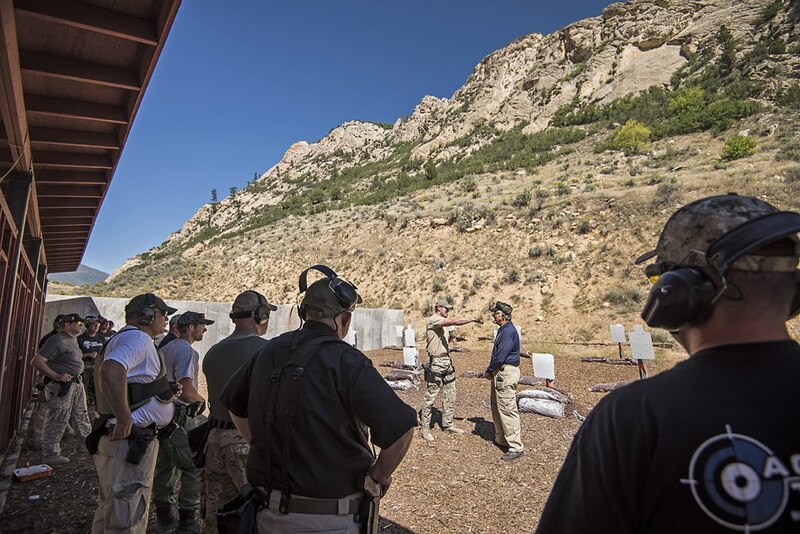 This year, for the first time, Action Target was the official target sponsor of ATAC Range Day which is put on by ATAC (Advanced Tactics and Countermeasures) Global as a way for military and law enforcement personnel to test new products in the tactical market. Much like Industry Day at the Range, several exhibitors sponsored shooting bays where attendees could shoot everything from service pistols to turret mounted machine guns. Action Target provided steel targets for all of the exhibitors at the event and displayed products in the exhibitor area. This year, Action Target moved to a new location where we were able to expand to a whopping 40′ x 70′ booth and combine with Law Enforcement Targets to demonstrate the full capabilities of our turnkey shooting range solutions. 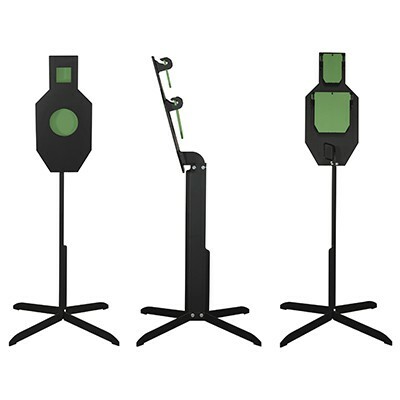 The booth included a steel target kiosk with new releases, a range design station where clients could print custom plans, a bullet trap deceleration chamber display, and a four-lane shooting range with functional target retrievers. 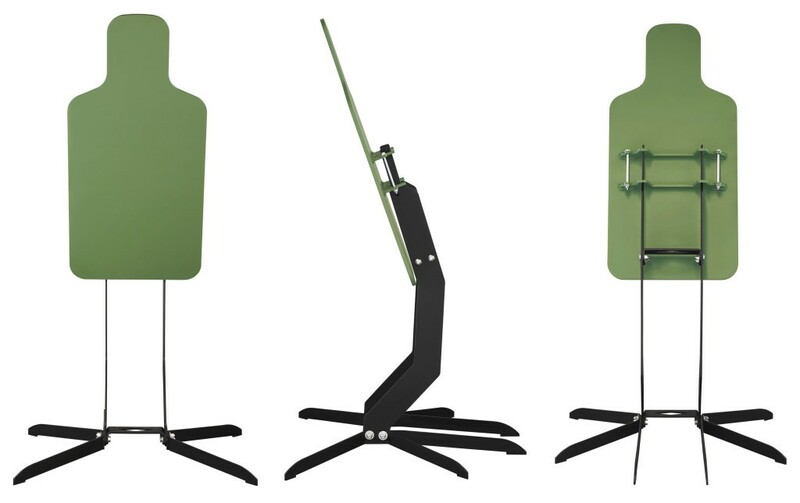 Action Target debuted two new steel targets at the show: the E-50 Silhouette and the PT IDPA Practice Torso. 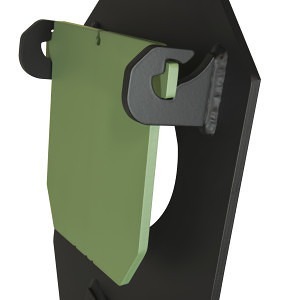 The E-50 Silhouette is the first commercially available target from Action Target capable of handling .50 BMG and is the only steel target on the market made from 1/2” AR550 armor steel. 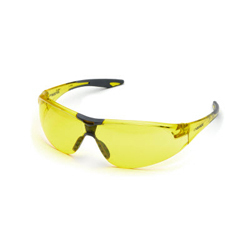 Designed according to U.S. Marine Corps steel target specifications with a 20-degree angled shooting surface and standard military E-type silhouette proportions, this target is made for everything from heavy military firearms training to long-range rifle shooting. With a patent pending stand design that keeps the target grounded even with the biggest of ammunition, you don’t need to worry about using sand bags to keep it upright or going downrange to reset it. 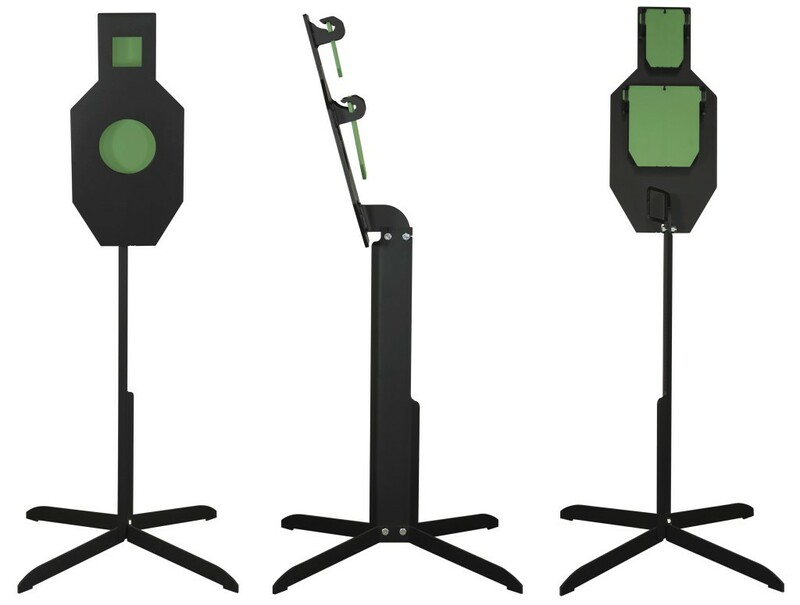 Hone your competition skills with the official IDPA steel practice target. The PT IDPA Practice Torso is the official steel practice target of the Independent Defensive Pistol Association (IDPA) and one of the most effective training tools for competitive shooting. It features a regulation torso shape including the -1 and -0 scoring zones with reactive swinging plates for the -0 head square and center mass circle which are both reduced 2” to encourage more accurate shooting. The reactive plates are gravity reset which means you can spend more time shooting and less time walking downrange. 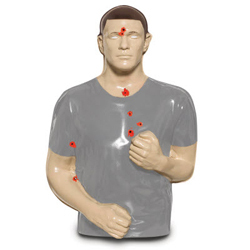 The PT IDPA Practice Torso also helps reinforce good shooting habits. For every shot that is on target, you get instant feedback from seeing the target react and from hearing the distinctive “clang” as the bullet makes impact. This allows your brain to make a connection between the exact muscle movements you made and the reward of positive feedback. On Wednesday night of the show, we hosted a client event at the Las Vegas National Golf Course with excellent appetizers, open bar, driving range contest, and some celebrity friends. More than 350 people attended including Rich Wyatt of Gunsmoke and Ted Nugent making for a great night with our clients and friends. Thank you to everyone who visited us at SHOT Show! If you weren’t able to make it this year, we hope to see you next time.